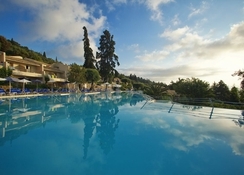 The Aeolos Beach Hotel is a luxury 4-star beach hotel on the lovely island of Corfu. Come and enjoy lush, laid-back holidays with family and friends amid some of the islands truly eye-catching scenery. The Aeolos Beach Hotel has four different bars and a variety of restaurants on-site that guests of the hotel can dine in each night. If you’re visiting with friends, unwind and enjoy treatments at the luxurious spa? Or if you've got the kids in tow, they can play in the collection of splash-tastic swimming pools on offer. Or if you prefer, you can dig your feet into the sand and relax all day at the beach, either way, this is the perfect destination for you. And if you’re up for a challenge, there are sports facilities available where you can play tennis and keep fit in the fitness studio; and then go back to relaxing by visiting the sauna! The location for this resort is perfect, it’s sat on the south east coast of the island, so it allows some breathtaking views of the sunrise and sunset each day. It’s a short walk away from the photogenic village of Benitses too, so visitors can also spend time exploring the local culture. 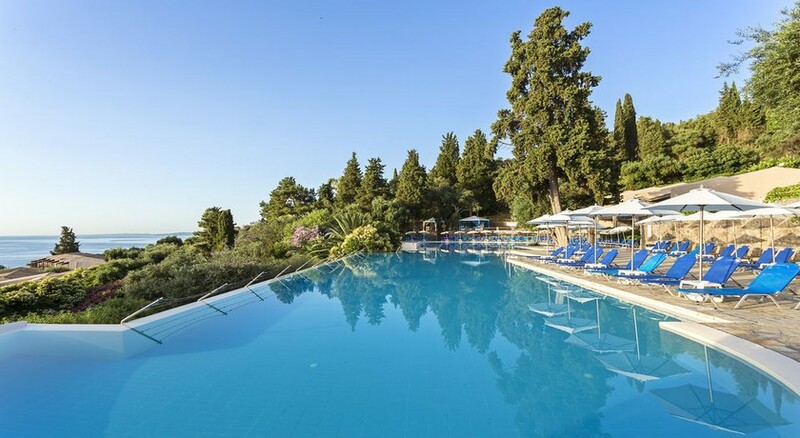 If you want to delve a little deeper into Corfu itself, the town centre is just 10km away - a short taxi that you can arrange at reception will get you there in no time. Airport Corfu can connect via direct flight to most European airports and is only a short 8km away. There is a wide variety of rooms available at this hotel, to ensure all guests are catered for. Choose from Double Rooms, Double Bungalows, Superior Bungalow Rooms, Family Bungalows, Family Suites and Deluxe Rooms. The majority of these have the option to have a Sea, Pool or a Garden view. The light pastel colour scheme of the recently refurbished rooms will certainly please all guests. Rooms come equipped with TV’s, Wi-Fi (charges may apply), a hair dryer, a mini fridge, kettle with tea and coffee that’s refilled daily. When it comes to restaurants, you can enjoy romantic private dining with views overlooking the Ionian Sea, or, you can visit the main restaurant on-site called Dolphin. Dolphin serves breakfast from 7am to 10am and continental breakfast from 10am to 10:30am. Lunch is served buffet style and is available from 12pm to 3pm, before closing and re-opening at dinner at 6:45pm to 9:45pm. Pizza and pasta lovers can dine at La Spiaggia, or for finer dining head to Paralia – an a la carte restaurant open from 7pm to 9:30pm, reservations are required here. There are plentiful facilities available at the hotel, from swimming pools and spa treatments, to water polo, watersports and in-house entertainment for guests to enjoy. Younger kids can enjoy activities put on by the mini club, which runs from 10am-12pm and 3pm-5pm, plus there is a mini disco open at 8:30pm so they can have a boogie too. Very helpful staff and friendly. Room was clean nice and had a whole view of the ocean which we had the pleasure of hiring a boat and heading out into. Very good value for money and transfers were very quick, they also had some nice scenic views on way to hotel. The hotel resort was clean,food delicious, entertainment ok,beach views gorgeous,staff helpful waitresses so accommodating room cool cleaned everyday.The only negative was entertainment in the evening was mainly for the French tourist . I had never been to corfu but I will defo be going again. The entertainment was brill. And even when we had 2 days of not very nice weather we still had the best time. The beach was brilliant. I'm looking forward to going again. Spa was expensive but nice. You have a local bus that you can buy tickets for in the reception area. The staff went above and beyond and the food was amazing. Hotel was great , food was amazing, staff were very friendly. Perfect spot for jumping onto the bus and seeing the sites. Corfu is a beautiful place and very easy to get around. You can't get lost here. As a single traveler it worked out lovely for me. Everyone at the hotel were friendly from the staff to the guest, there wasn't day where I didn't meet up with someone new and having a chat, The gym is very small and needs updating but did the job . the spa ladies are very helpful and I had a great massage in there. The waiters and waitresses work so hard to keep us all feed. Well done, you all do an amazing job. The hotel room was a sea view, over looking the pool. The pool music started up about 10.00 a.m and finished by 5.00pm. The stair well was very noisy, you can hear everything day and night . Take your ear plugs. Over all I really had a brilliant time here, I felt safe and was happy to get out and see what corfu offered. If I went back I'd go for a garden view, the rooms looked a little more quite and they aren't so far up the hill. It is very hilly , worked all the amazing puddings off though. Hotel lovely, food good, hotel grounds attractive with beautiful shrubs and flowers. Some people might struggle with hills. Pool freezing which was a shame as it was a wonderful pool.